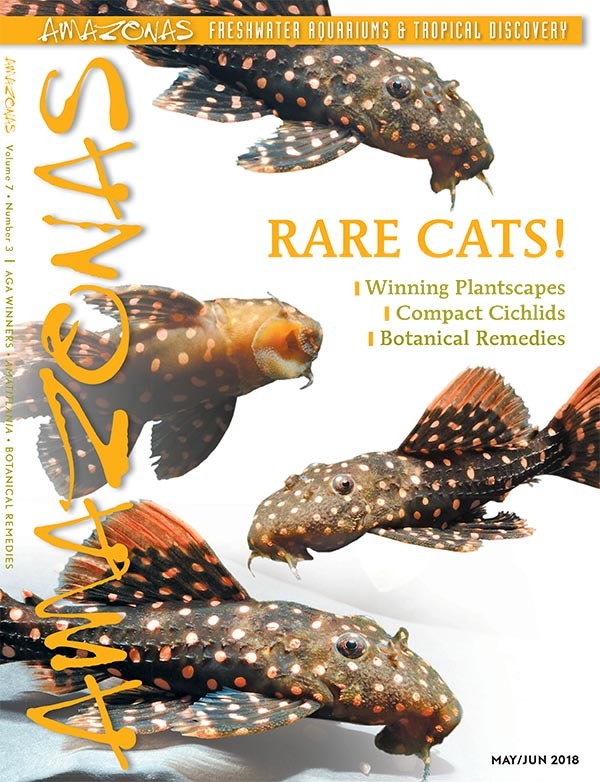 AMAZONAS Magazine, Volume 7, Number 3, RARE CATS!, an issue dedicated to the quirky species that breeding could one day make available to more hobbyists. 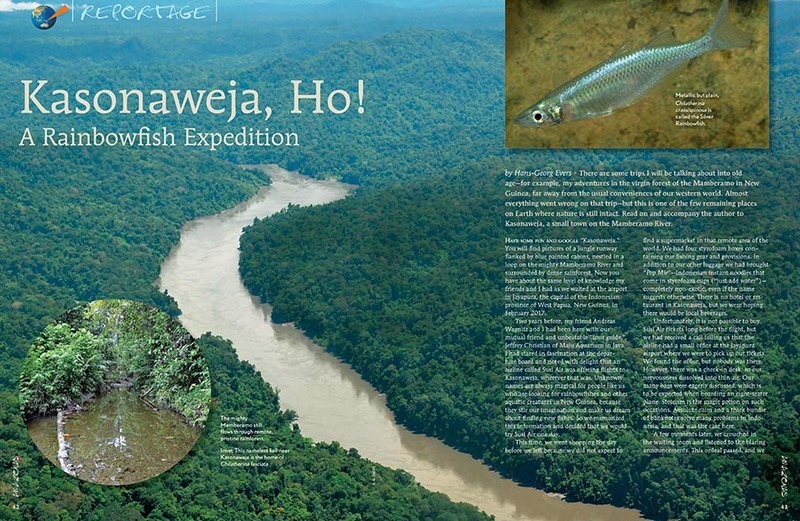 On the cover: Pseudacanthicus sp. LDA 105 “Typhoon,” images by Hans-Georg Evers. 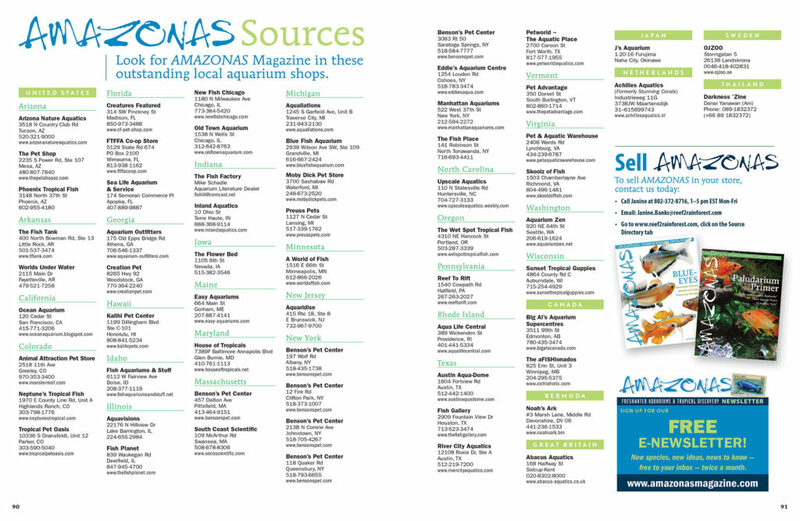 The May/June 2018 Issue of AMAZONAS Magazine is printed and on its way to magazine subscribers, local aquarium shops, and better bookstores. On sale April 3rd, 2018. 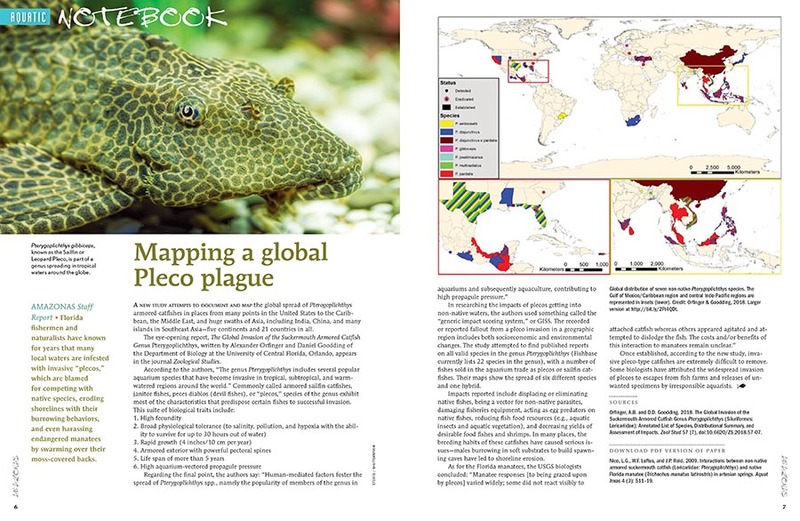 “It is time to feature Loricariids again—but those who expect the focus to be on L-number catfishes may be disappointed. 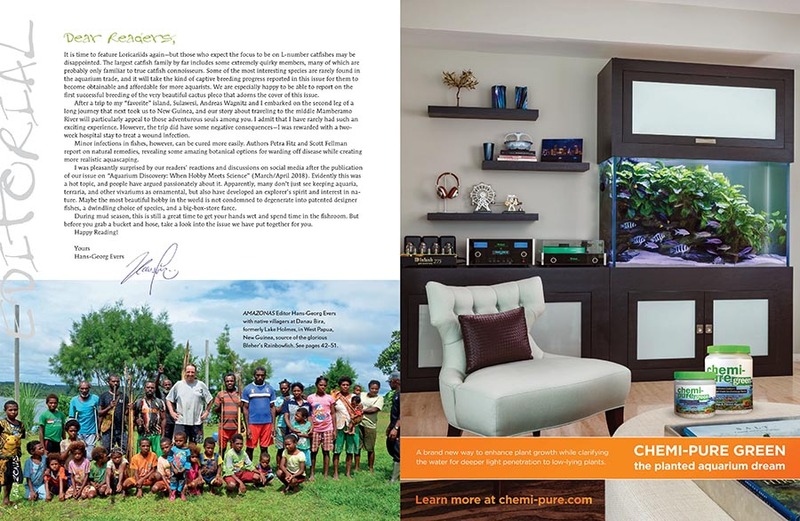 Some of the most interesting species are rarely found in the aquarium trade, and it will take the kind of captive breeding progress reported in this issue for them to become obtainable and affordable for more aquarists.” Hans-Georg Evers, introducing the RARE CATS! issue. 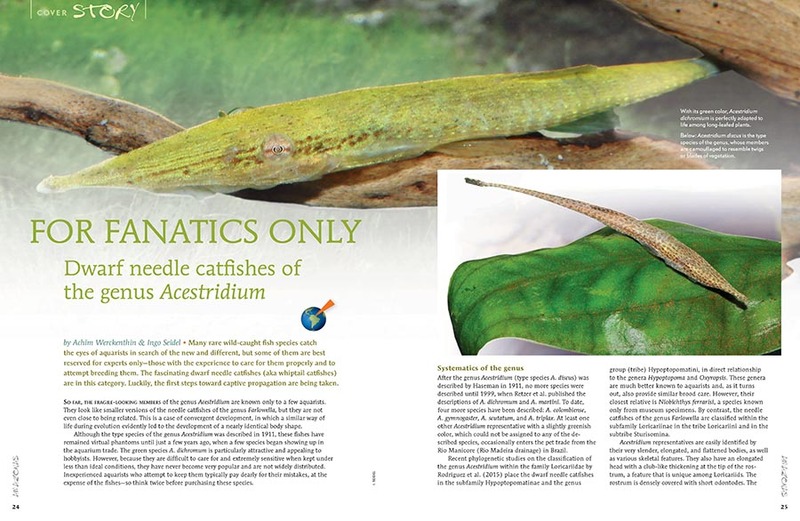 Achim Werckenthin and Ingo Seidel present the Dwarf Needle Catfishes of the genus Acestridium, which are at times sensitive aquarium inhabitants that present a husbandry and breeding challenge for experienced aquarists. 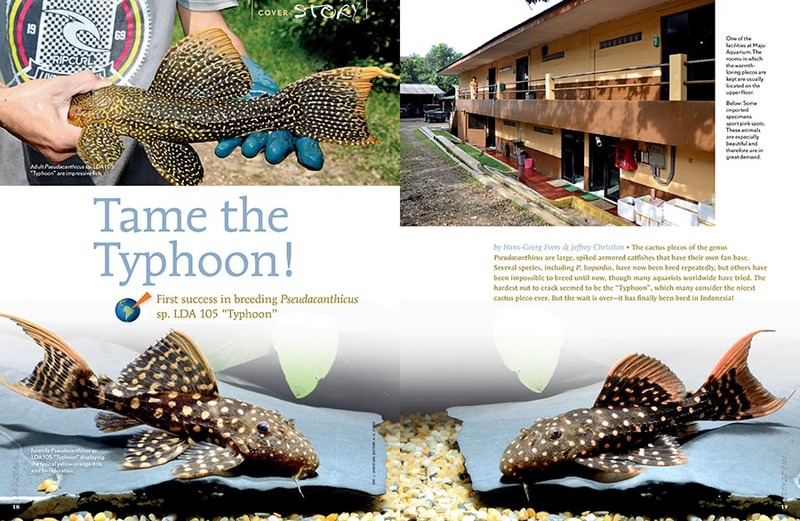 There are numerous barbel-bearers among the catfishes in the family Loricardiidae, but the genus Rhadinoloricaria has been nothing more than a phantom in the minds of catfish lovers for a long time. 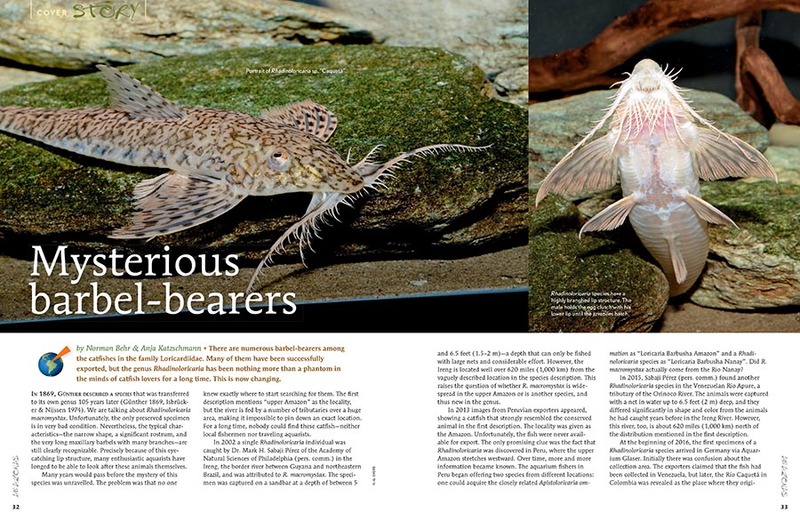 Norman Behr and Anja Katzschmann explain how these mysterious fishes are finally being revealed. 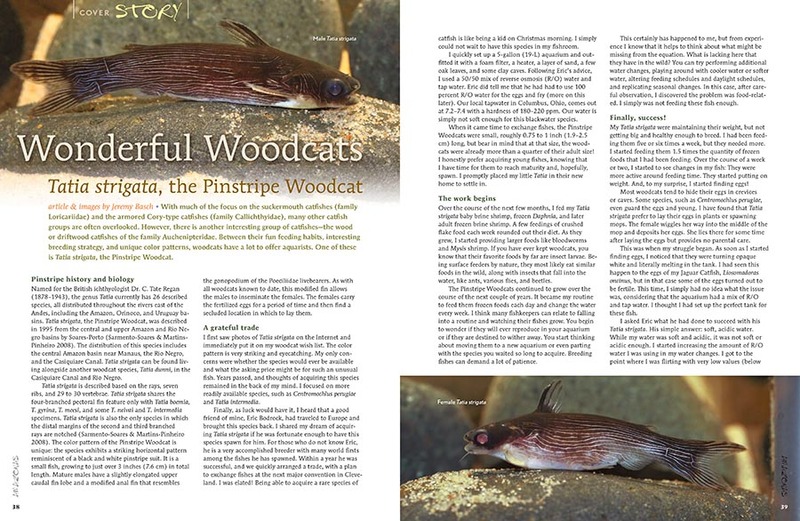 Jeremy Basch shares his struggles and triumphs with the beautiful and unique Pinstripe Woodcat, Tatia strigata. 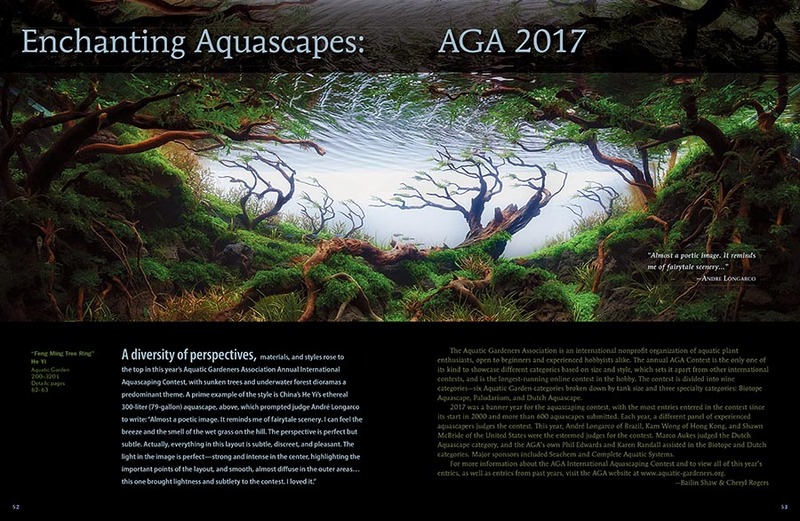 As aquascapers around the globe are gearing up to compete in the Aquatic Gardeners Association’s annual international Aquascaping Content this fall, we look back at the best planted tanks to learn what it took to win in 2017. 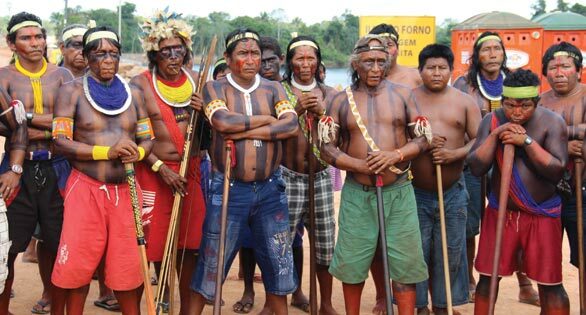 Neotropical Cichlids have, at times, received a bad rap. 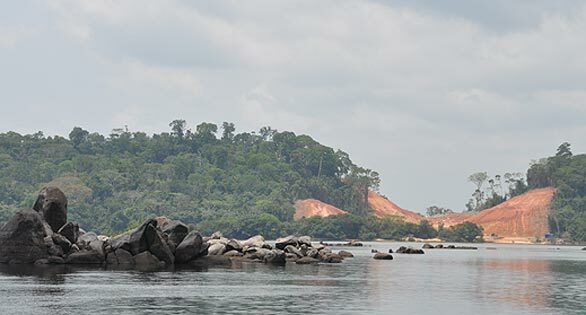 Dr. Paul V. Loiselle writes in praise of worthwhile compact cichlids in a novel genus whose members were formerly known under more familiar names—Heros, Cichlasoma, Cryptoheros, and Archocentrus—and are now grouped as Amatitlania. 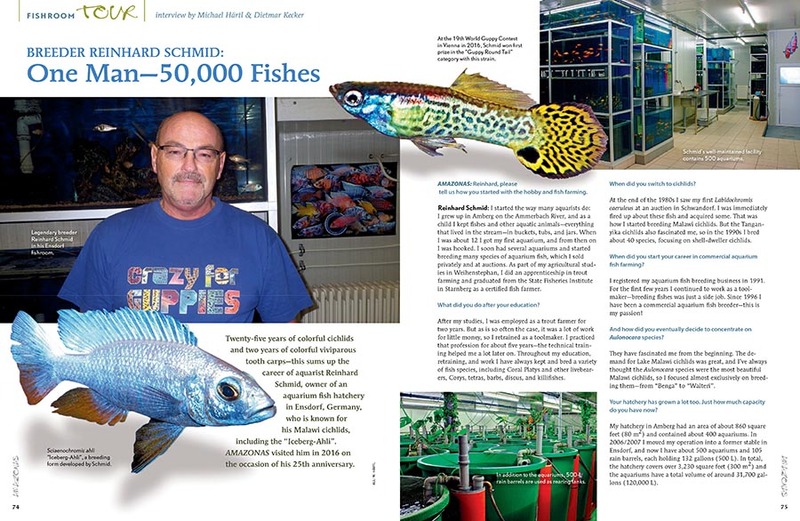 Michael Härtl and Dietmar Kecker interview Reinhard Schmid, owner of an aquarium fish hatchery in Ensdorf, Germany. 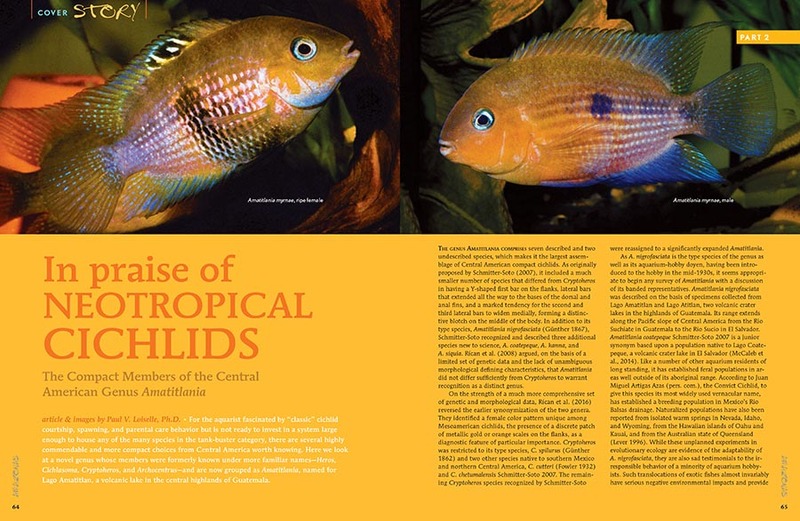 Schmid is best known for his Cichlid production, and the hatchery is responsible for introducing aquarium strains such as the Iceberg Ahli and the hypomelanistic Turquoise Aulonocara. 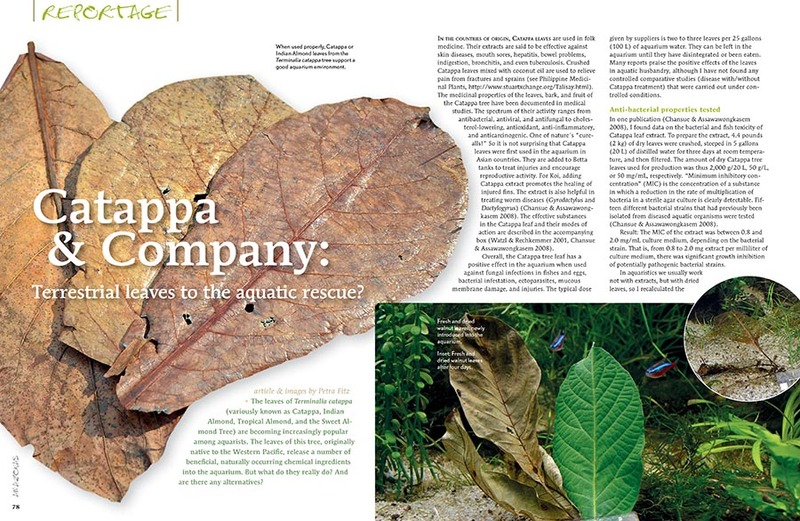 Petra Fitz examines the science behind Catappa (Indian Almond) leaves as they’re used in the aquarium, and illustrates some alternatives as well. 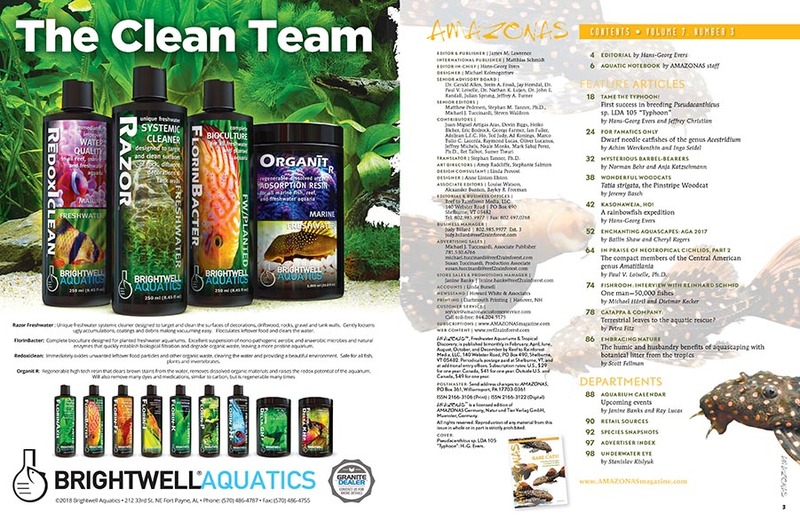 Scott Fellman, “Chief Tint Officer” at Tannin Aquatics, embraces nature, discussing the humic and husbandry benefits of aquascaping with botanical litter from the tropics. 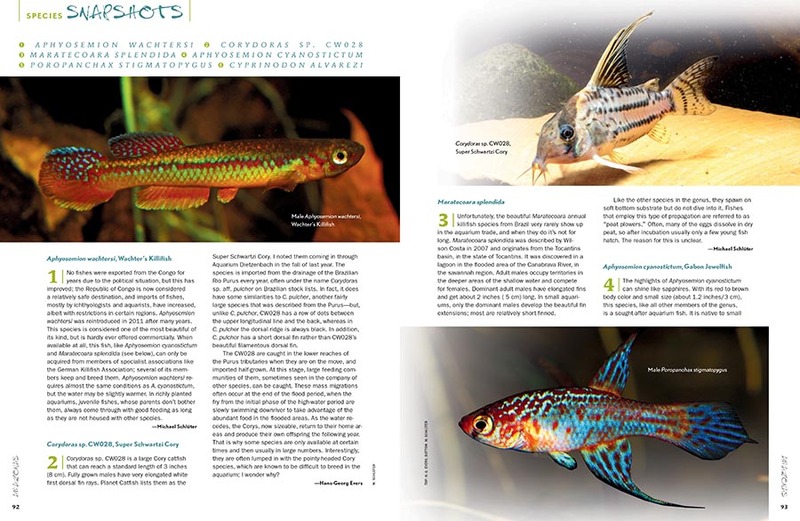 AMAZONAS Magazine’s must-read Species Snapshots bring insight into the new, unusual, and under-appreciated in the aquarium hobby and trade. 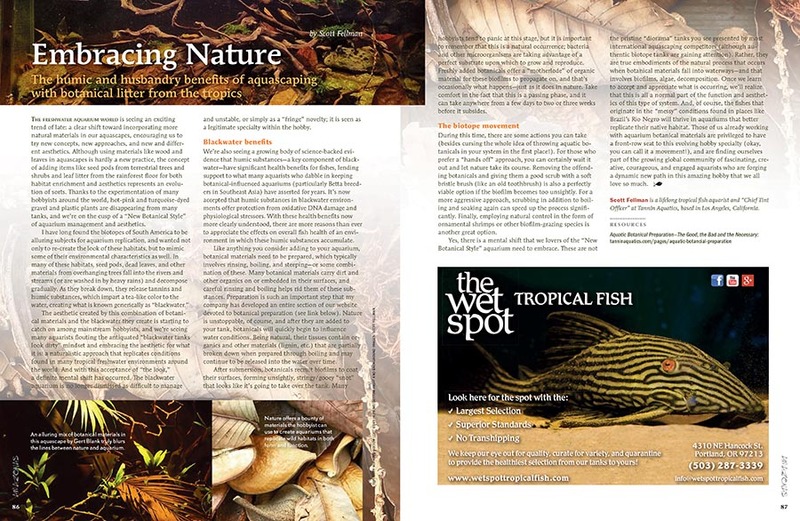 This issue’s installment shines a bright spotlight on Killifishes. 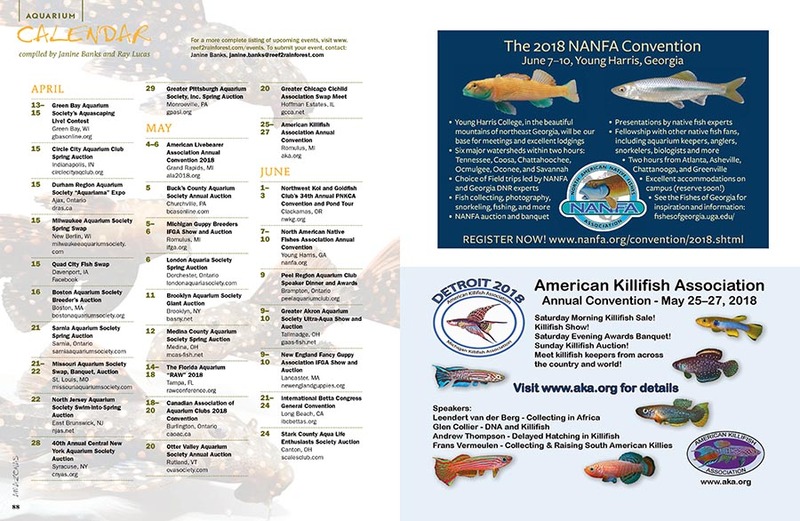 Our coverage includes Wachter’s Killifish (Aphyosemion wachtersi), Maratecoara splendida, the Gabon Jewelfish (Aphyosemion cyanostictum), Poropanchax stigmatopygus, the Potosi Pupfish (Cyprinodon alvarezi), and, for the catfish lovers, the Super Schwartzi Cory (Corydoras sp. CW028).